In Fight Klub’s minute-to-win-it format, the battling MCs only have three 60-second rounds to destroy their opponent. 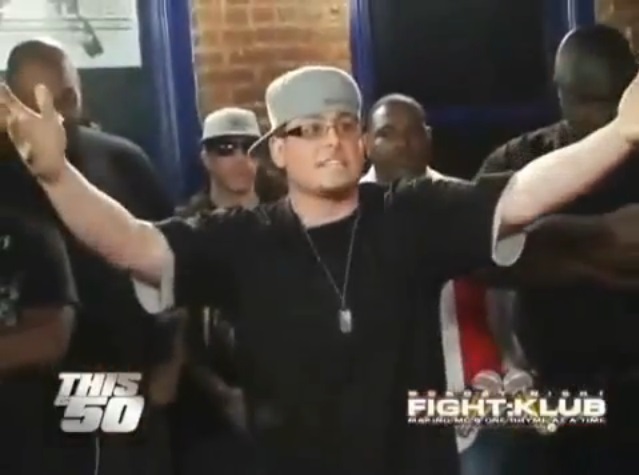 Fight Klub champ Jin tha Emcee (famous for being an early conqueror of 106 & Park’s Freestyle Friday competition) knew the rules, but chose to hold back until the third round by which time his back was against the wall. Solomon, then a hungry star on the battling circuit, dominated each round-especially the second, which he ended with, “Your career’s the saddest story, all your battles corny, now you and Canibus can share the same category.” Needless to say, Iron Solomon walked out with each and every Benjamin that Jin promised he’d win. This entry was posted in Fight Klub, Iron Solomon, Jin and tagged Battle Rap Lyrics, Fight Klub, iron solomon, Jin, Rap Battle Lyrics. Bookmark the permalink.